The Great White Shark is one of the fiercest predators on the planet. Just ask the crew of the Orca. But every predator has a weakness. For the Great White, that weakness is "the still." Sharks need to stay in motion and continually keep swimming to stay alive. Even a short break in the action means death. With myShark, it's your quest to keep your beloved Great White pet alive for as long as you can. 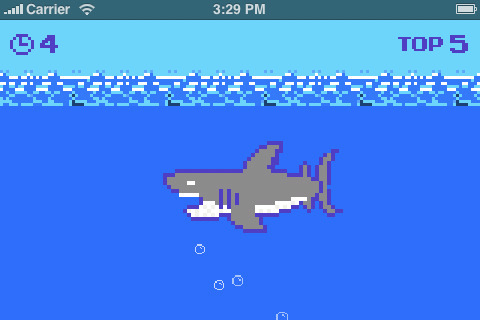 Keep your shark moving for as long as you can by moving your iPhone back and forth in smooth shark-like strokes. How long can you keep it up? Remember, if you pause for too long, your shark goes belly up. Literally. A timer keeps score of your personal best time. How long can you keep the shark alive?